Kids' Book Review: Interviews: A Very KBR Christmas! Interviews: A Very KBR Christmas! It's been a another boom year for brilliant children's books. All of us here at KBR absolutely adore sharing the brightest and best with you and now, just before we temporarily trade in our pencils and pens for gingerbread and fairy lights, here are few festive reflections from our dazzling team members. You might want to settle down with a glass of Eggnog with this one; when it comes to books and Christmas, we have quite a bit to say! Connie: Family, Gratitude, Philanthropy, Food and Bon Bons! Penny: Magic, joy, family, madness, pudding! Sally: Family, food, fun, excited kids! Sarah W: Family, generosity, reflection, children, joy. Which children’s Christmas (inspired / themed) book best epitomises your idea of Christmas? Tania: Marguerite’s Christmas by India Desjardins and Pascal Blanchet, because of the deeply subtle way it strips Christmas down to the bare bones of humanity. That, and the absolutely stunning imagery. I wept and wept over this book. Connie: Chronicles of Narnia: The Lion, the Witch and the Wardrobe by C.S Lewis - because I read it one christmas when I was a tween. Penny: For me, What Do You Wish For, by Jane Godwin and Anna Walker, and Merry Everything, by Tania McCartney and Jess Racklyeft, both capture the warmth and magic of Christmas. Sally: The Night Before Christmas, because it’s all about the anticipation!!! Anastasia: The Christmas Miracle of Jonathan Toomey. Leanne: John Williamson’s Christmas in Australia – reminds me of our large family get-togethers and the chaos of trying to get a family photo. If you were given the opportunity to invite one children’s author or illustrator to spend Christmas Day lunch with you, who would it be and why? Tania: Roald Dahl, for sure. For the intellect, the irreverence, the imaginative possibility. It would certainly be entertaining! And I’m hoping he would gift me a Golden Ticket. Dimity: Too hard – who thought up these questions? Nicky Johnston because I’d love to share such a special time with such a special person. Tania McCartney because we’d run out of food before we’d run out of things to discuss. Peter Carnavas because I’ve cooked for him before and I’d like to break bread with him again. But I’d settle for Bruce Whatley because I reckon our Christmas conversation could stretch beyond books, and art and creativity. Clearly, I have a thing for illustrators! Jo: Kate DiCamillo, because her stories are filled with heart and real characters and I can’t get enough of them. Connie: Just one?! Sorry, can’t I squeeze in Melina Marchetta, John Marsden and Jennifer Donnelly? Because they have taught me so much. Penny: I’d love to sit down with Jackie French over Christmas lunch and talk books and gardens for hours. And my little girl would have the carrots ready, in case she brought a wombat along. Shaye: That's just mean KBR! If it has to be only one, I'll invite Marc Martin because I would love an opportunity to chat about his methods and maybe watch him work. His illustrations are glorious! Sarah S: Beatrix Potter, because she'd be fascinating to talk to and share the time with. Sally: Heidi Cooper Smith - because we have only met once in person and I think Heidi and I would be great friends if we lived loser together! I'd love to have a beer with her. Sarah W: How could I just choose one? Maybe Jackie French because we can talk children’s books, wombats and gardens. Leanne: Harry Laing, author of Shoctopus: Poems that Grip You. Harry could share his fabulous poems to entertain the whole family making a day of joy and laughter. You’re allowed to spend the Festive Season at the North Pole. What three books would you just have to take along with you? Tania: I would take the last two purchases I’ve not yet had time to devour—Lagom: The Swedish Art of Balanced Living by Linnea Dunne (Gaia) and The Atlas of Monsters: Mythical Creatures from Around the World by Stuart Hill and Sandra Lawrence (Big Picture Press) And of course, I have to say my own book with Jess Racklyeft, Merry Everything (Windy Hollow), because I really do love this book, and never tire of perusing the gorgeous illustrations. I could share it with the reindeer and the polar bears. Penny: Little Women, by Louise May Alcott, to warm the cockles; The Lion the Witch and the Wardrobe, by CS Lewis, because spring eventually comes to Narnia; and I’m thinking some kind of Arctic survival guide might come in handy. Shaye: Alyzon Whitestarr by Isobelle Carmody, Tomorrow, When the War Began by John Marsden and Outliers by Malcolm Gladwell. They're all on my to re-read list! Sarah S: Anne of Green Gables (a favourite oldie but goodie! ), The Complete Works of Jane Austen (entertaining and insightful and you can read them more than once), and Lonely Planet: Greenland & The Arctic (for travel advice and inspiration). Sally: I think I’d take pop luck at a second hand bookshop and just pick three at random. I don't really like to reread books I have already read. Sarah W: My Big Christmas Book, a big red book filled with Christmas short stories, poems and songs that I have kept from my childhood. Something on my to read pile, maybe The Book of Dust by Philip Pullman and, finally, and an old classic, something like A Little Princess by Frances Hodgeson Burnett. Anastasia: The Wordburger, a dictionary, and a thesaurus. Penelope: This one is too hard - no fair. Only three?????? I would take an anthology of poetry. Salamander by Thomas Wharton, and a story such as The tale of Despereaux, The Journey of Edward Toulaine, The Wind of the Willows, something classic to read with my family. We are big on choosing a chapter book that I read aloud during holidays. Last holidays it was Wormwood Mire by Judith Rossell. If you could turn your favourite children’s book into a Christmas pantomime, which one would it be? Tania: Eloise by Kay Thompson and Hilary Knight (Simon & Schuster). Could you even imagine?? 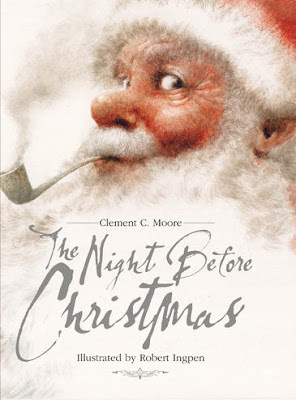 Dimity: The Night Before Christmas by Clement C Moore. I think there would be lots of comic fun to be had with this classic. Penny: I think (one of my many favourites!) The Paper Dolls, by Julia Donaldson and Rebecca Cobb, would make a stunning pantomime. Shaye: You Must Bring a Hat by Simon Philip. That would be hilarious! Sarah S: I have too many favourite books, but I think I'd choose: The Church Mice at Christmas by Graham Oakley. Penelope: I think The Memory Tree by Britta Teckentrup would make a lovely pantomime. You could really expand on each of the animals tales about the Fox and act them all out. Maybe a little sad but I can see it all. Second choice would be The Sisters Saint-Claire by Carlie Gibson and Tamsin Ainslie. If you could help Santa fill his sack this year, what gifts would you include? Tania: I know you’re not expecting this, but what else is there? BOOKS! I would gift Oliver Jeffers’ new book Here We Are, Saga Land by Kari Gislason and Richard Fidler, and The Cat in the Hat 60th Anniversary Edition (all three are with HarperCollins). Dimity: Empathy, my book, The Fix-It Man, and choc covered almonds, because there are never enough of these to go around. Jo: Love, hope, peace on earth. In other words, compassionate and capable world leaders, a safe place to live and enough food and water for every person on earth, the eradication of greed, ambition and prejudice. Connie: One book with every toy. Penny: I’d weigh poor Santa down with lots and lots of books! For everyone. Sarah S: A bunch of books of course (a couple for me, the rest for other people): Saga Land by Richard Fidler and Kari Gislason, The Sloth Who Came to Stay by Margaret Wild and Vivienne To, Gecko by Raymond Huber and Brian Lovelock, Dino by Diego Vaisberg,10, 9, 8 ... Owls Up Late by Georgiana Deutsch, Slow by Brooke McAlary, How to Stop Time by Matt Haig, Artemis by Andy Weir, Fools and Mortals by Bernard Cornwell, Harry Potter A History of Magic by the British Library. Sally: Experiences rather than gifts. I have had enough of stuff and I don't want any more of it. I need to do a big clear out of stuff and have a clear and organised house for next year. I would like to sprinkle some magic dust around over 'busy' people to just press a pause button and give everyone more time to just be. It seems to me that many many people are doing doing doing, rushing rushing rushing and it makes me feel like I have to do more just to keep up. Press pause people; slow down so we all can slow down. Sarah W: Books, more books and perhaps some more books. Also, some craft supplies to get the kids using their creative brains and some outdoor toys to get them exploring their world. Though my 3-year-old would probably just like rocks. Anastasia: Books, Books and more Books! Leanne: Books, chocolate, bubble bath, art supplies, a gift voucher that gives me one whole day to do whatever I want, something sparkly and more books. Penelope: Good quality art supplies, new brushes and hot press watercolour paper. Book vouchers (because there’s nothing as special as a trip to the bookstore to choose a new book). I’d also ask ‘Santa’ to invent a ‘pocket of time’ device to tuck away for when you need a little extra in your day. WISHING YOU A MERRY EVERYTHING CHRISTMAS FROM THE ENTIRE KBR TEAM!